Editor's note: This post was written by DigitalCrafts alum Merilee Wheelock, who graduated from our April 2017 Immersive bootcamp. As each student who has attended DigitalCrafts can easily tell you, uprooting your career to complete a coding bootcamp is truly a life-changing experience. But two weeks before my graduation date from DigitalCrafts, I faced another major change: My husband accepted a new job in the San Francisco Bay Area. Amidst all the practical concerns—selling our house, finding a new place to live, scheduling the cross-country movers—I never quite prepared myself for what it would be like to find a new job in a new industry, 2500 miles from home. In the end, I found a role that I love, but getting there wasn’t always easy. Here are the top things that helped me stay sane and land the job. To me, “networking” always seemed like an event you attend, like a Meetup or a career fair. I had always considered networking to be the kind of thing you plan to do once a week, and that’s it. Moving to Silicon Valley taught me otherwise. I learned that every time you’re talking to someone, you’re networking, whether you realize it or not. People want to talk about what they do, and what you do, and often they’re quick to offer suggestions. On someone’s advice, I joined my university’s Bay Area alumni group, where I met a lot of people who primarily work as software developers, ranging from small startups to some of the area’s largest tech companies. I would be lying if I didn’t express how intimidated I was to be surrounded by such bright developers, but I was sure to listen and learn from what they had to say about their own experiences moving to and working in Silicon Valley. The most unexpected lesson I learned from networking is that people are surprisingly eager to help you—if you’re willing to ask for it. I asked one friend to review my resume with his colleagues, which yielded some great feedback and new introductions. Someone who knew I was searching added me to their network and forwarded me job openings when they came up. Tip: When networking, don't be afraid to ask for help, because the people who are willing to help are the people you want in your network. Then pay it forward and let others join your network; you never know when a new connection could pay off! Have you heard of imposter syndrome? It’s the belief that you are inadequate and will be exposed as a fraud. I think this is something that many of us face when we are outside of out comfort zone, so it’s unsurprising to experience it when looking for a new job in a new industry, and being in a new city only magnified those feelings. Imposter syndrome was hitting me hard. After living in the Bay Area for four months, I’d had only one mediocre phone interview and was losing all confidence. Here I was in Silicon Valley, completely immersed in the center of the tech industry, and I couldn’t find a way to fit in. I felt rejected, and I just wanted to go back home to Atlanta. I wondered whether this new career was suited for me, and if my move to a new city had been a mistake. Tip: Ultimately, what helped me overcome my imposter syndrome was meeting more people, and understanding that the feeling of fraudulence is something that we all experience. Transitions are rough, and it's easy to feel like we don't belong in an industry or in a city in which we have no experience. With some time, it becomes easier to believe in what you’ve worked for and what you are capable of. I needed to pull myself out of that rut, and to be honest with you, it was tough. I knew I needed a change, so first I focused on what I could do. I exercised, drank some wine, and spent lots of time outside. Those were things I could control. I also had complete control over how many jobs I applied to, and I took advantage of the abundance of job postings that Q1 of 2018 had to offer. I also practiced coding, I read article after article on interviewing in the Bay Area, and I never stopped submitting applications. Tip: If you're looking for a career change, don't let yourself have a passive day. Don't let a day pass where you don't spend at least a few minutes practicing coding or applying to a job. Stay active, and stay in control of your career journey. I cannot tell you how many people I encountered who told me, “It’ll work out.” Their attempt to comfort me always felt like gross overconfidence in my skills—that is, until it finally did work out. I found a job posting for a product manager position at an EdTech startup on Hacker News, and truthfully, balked at the application as soon as I saw that I’d be the first employee. I imagined the role being too stressful, too out of my league. However, I didn’t want to let my fear of failure keep me from even trying, so I submitted my application. Two weeks later, I had an offer. Merilee, right, tries out her company's VR app with coworkers. I didn’t know what to expect as the first employee at my startup, but it has certainly been an exciting and nonstop ride. As a software developer at a company with only three people, you can’t just sit back and wait to be told what to do. You need to actively participate, and then be willing to work on your own and hold yourself accountable for your work. There is a level of uncertainty and pressure that comes with working at such an early-stage startup, but it is exciting to immediately see how much your work matters to the company. At the end of this process, I’ve found that some of our biggest risks lead to pretty awesome rewards, as long as we’re willing to accept new opportunities as they come along. My path doesn’t look like I had expected it to, with twists and turns along the way. I studied educational psychology in school, then decided to move into web development and enrolled in a bootcamp at DigitalCrafts. But now, after an unexpected move and lots of hard work, I’ve found an EdTech startup with a role that feels like it was designed for me! 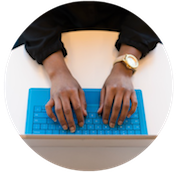 Ready to take the next step in your career as a new developer? Download our course packet for more information about our full-stack web development bootcamps.